County Administrator Tim Hemstreet has his marching orders for fiscal year 2017 budget, which indicate Loudoun property owners would not see much change in the county tax rate or in their tax bills. However, that plan would leave the schools $39.5 million short of the superintendent’s request. 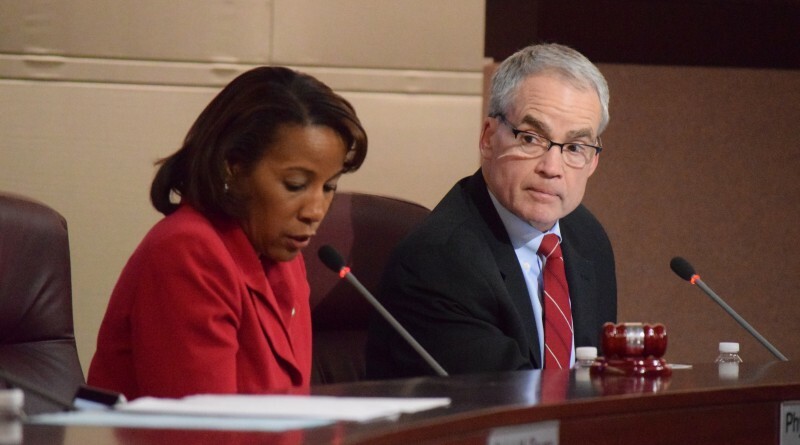 The new Board of Supervisors last week voted unanimously to direct Hemstreet to prepare two budget scenarios—one based on the current real property tax rate, $1.135 per $100 in assessed value, and another based on an equalized tax rate of $1.130, which would keep real estate tax bills level for the average Loudoun homeowner even though overall assessed values have gone up slightly. The equalized tax rate is based on an average of all property values in the county. Individual real property owners will see their tax bill change depending on how their property value is assessed from year to year. Supervisor Geary M. Higgins (R-Catoctin) agreed. Supervisor Matthew F. Letourneau (R-Dulles) said creating a budget with both figures gives the county options in terms of which projects to undertake with extra revenues, and which programs to slash in case of a shortfall. However, supervisors will likely get some push back. Even if they adopt a budget at the current tax rate, it would leave the spending plan drawn up by Loudoun Schools Superintendent Eric Williams $34.8 million short. Williams is proposing a budget of $1.07 billion, $86.7 million more than the current fiscal year. In October, Williams predicted the 88-school division would need a total budget increase of as much as $95.4 million, and get just $13.8 million more in state funding. That would have left the county taxpayers shouldering $81.6 million in new funding for schools. Instead, the budget Williams presented Jan. 7 would require $58.3 million in new local funding, aided in part by a revised estimate of $26.1 million in new state funding and by a lower total budget increase of $84.4 million. That budget, like the one the county administrator will introduce Feb. 10, is not final—it’s a starting place. Each board will then hash out the details. The danger, which the School Board readily pointed out with Mr. Williams’s proposed budget, was the shift from the County Transfer to the State Transfer. Meaning, the state contribution was $13M higher than previously stated while the County contribution dropped $20M. Nobody will know what the state contribution is until the County budget process is done. What will the County do if the State contributes less? It is not something that can have a precise answer right now but it is certainly something to keep in mind. While the County Transfer was less than originally projected, those funds were moved to the State Transfer which if far less stable and more unpredictable. Also, by increasing the total annual allowable debt the County can borrow from $200M to $220M the County can “spend now and pay later” to a greater degree. Yes, it is for capital “stuff” but money is fungible and you can move it around. I’d like to see a map of what parts of the County are paying more and what ones are paying less under these “equalized” rates because I’ve only heard of people saying their taxes go up. Where are they going down? We need to look at the structural budget/taxes over the long run. The schools are the largest driver of the budget. It is driven mainly by increased enrollment and the salary scale. County services are also related to increased enrollment since that results from population growth itself. This year we saw 3.8% growth in our school enrollment. We saw effectively 0% inflation. So one is inclined to project 3.8% growth in the schools budget. But instead, we are staring at an 8.6% request from LCPS! Is this an anomaly? Is LCPS just gouging the taxpayer at over 2x their enrollment growth rate? No and yes. The $86M increase in the budget is in the ballpark ($75-85M). This is not the same as the days of King Hatrick. The added costs result from VRS increases (previously known), salary scale increases (previously known), fleet purchases (previously known), healthcare (predictable), and other service expansion (discretionary). So the real question is if all these added costs were known, why is it such a surprise that LCPS is asking for 2.3x more money than enrollment growth? Why doesn’t LCPS project its costs into the future? Many folks in this county work in the federal space where POMs (essentially 5-7 year forecasts) are a mainstay. Can we predict the budget 5 years out perfectly? Of course not. But one needs to understand how we project costs over time to see if a program is affordable. LCPS officials refuse to do that. At a recent board meeting, both board members and officials said “growth” wasn’t predictable. That’s ludicrous. While it depends on BOS actions, we will see between 2.0% – 4.5% growth going forward, likely centered around 2.5-3.0%. You can project based on that range and adjust as you go forward. 1. VRS: I asked VRS officials on their Facebook page had they provided training to local agencies on the costs of pensions. They clearly said yes. So when Chrmn Hornberger says he “doesn’t understand” VRS or that we can’t know how much is going to be required to fund pensions, he is flat out lying to you! We know that pensions must be funded and that it runs 17.5-18.2% of payroll. Currently, our “increased” payment gets us to the 14% range. We are still way short of what will be required every single year to fund these pensions. While we don’t have to pay 18% to VRS this year, we should budget that amount in our long-term projections. Hornberger refuses to even acknowledge that we roughly know how much more we must pay in FY19 and will not provide this forecast. Thus, LCPS really requires another $10-15M to fully fund the teacher pensions on an annual basis in addition to what they asked for in FY17. 2. Salary scales: normally, a company provides additional compensation funding to cover inflation (CPI) and some wage growth. But they don’t have to raise everyone’s salary to a new position since senior workers leave, current workers are promoted and new workers start from the bottom. Because our teachers are so junior (lower end of pay scale), a step increase really does cost $$ for virtually every teacher. We have very few who retire and all existing teachers move up in step and salary. This is not about to change quickly. Thus, in addition to hiring more teachers to teach more students, we must pay the existing teachers more every year. That increases salary costs from 3.8% (enrollment growth) to about 5.8% (adds in step increases). But we can project this into the future too since we know roughly how long it will take to reach steady-state where teachers are distributed across all steps. Some will say FDK is a large cost this year. Wrong. It was less than $10M of the $86M cost. We knew these costs were coming but LCSB kept the public in the dark so each year they can extract maximum funding from the public. LCSB needs to take ownership of their long-term costs and justify why we are destined to see 6-7+% budget increases for the foreseeable future. The real question is whether the BOS will force LCSB to submit not only their requested cash budget but an additional structural budget that shows the actual “cost” of their workforce and operations. That is at least $60M greater than what was submitted this year ($10M for VRS and $50M for unbalanced teacher distribution). LCSB should also provide a “POM” for the schools that includes projections over the next 5 years. Hint: if they won’t project enrollment growth, here’s assumptions for FY18-FY22: 3.5%, 3.2%, 2.9%, 2.7%, 2.5%. Add in $15M for VRS in FY19 and that’s all you need. Will we ever require LCSB to become a professional board or will we allow them to hold the public and the BOS hostage every January with their song and dance?